Sunday, December 8 and Monday, December 9 2013-Pensacola, Florida: Well we are a bit surprised but very happy to once again be in Florida. Surprised because our intended route to the west this year had a more northerly track and happy because we like Florida (read, we like being warm) and as Maine residents, we have an obligation to visit Florida during the winter months. Actually I think it’s a Maine State Law. In addition, we are finally enjoying some warm, albeit damp, weather…..the temperature is in the 70’s and the humidity is hovering near 100%. Well, unless it’s actually raining, then it is a bit drier. Virtually everything is dripping wet…..it feels like living in a sauna! However it also feels pretty darn good after a month or so of frigid temperatures. The below mist shrouded image is our back yard, which I’ll explain later. The name Pensacola comes from the early Native Peoples and means “Village of the Hairy People” which is what they called the early Spanish settlers. With a population of just over 50,000 folks, Pensacola is the westernmost city in the state of Florida and a major seaport as well as the location of the nation’s first Naval Air Station and the home of the famed Blue Angels Flight Demonstration Team. 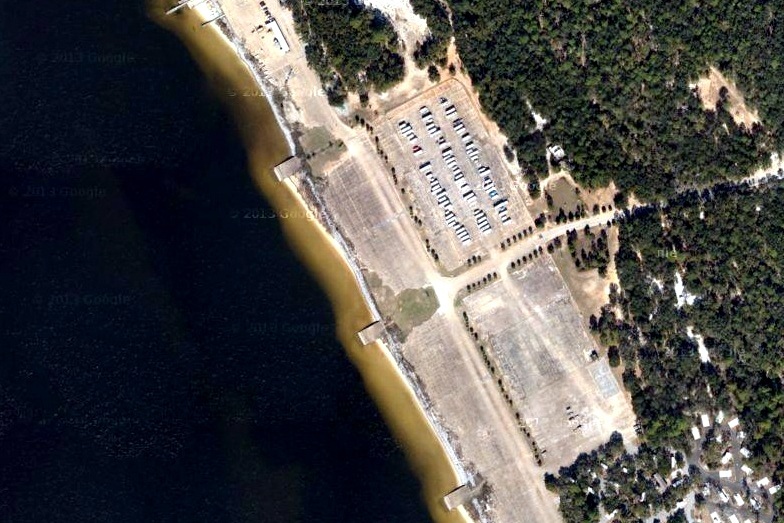 The Pensacola area actually has two military campgrounds. One we’ve stayed at before and is known as Oak Grove Park which is on the Naval Air Station itself and fronts the Gulf of Mexico. The other is Blue Angel Navy Recreation Facility which is situated more inland on Perdido Bay……this is the one we decided to try this trip. 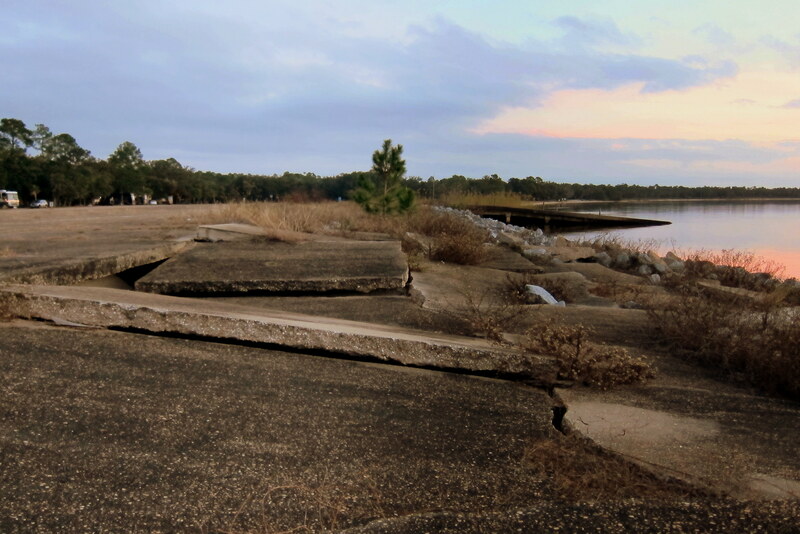 As usual, I took a walk about the grounds (Kit calls it “Scout and Patrol”) and discovered this Navy recreation facility is built on the old Pensacola Navy Seaplane Base, which explains the large expanse of concrete and large ramps leading into the water. The campground we were in was nestled in the treed areas at the lower right of the above photo. 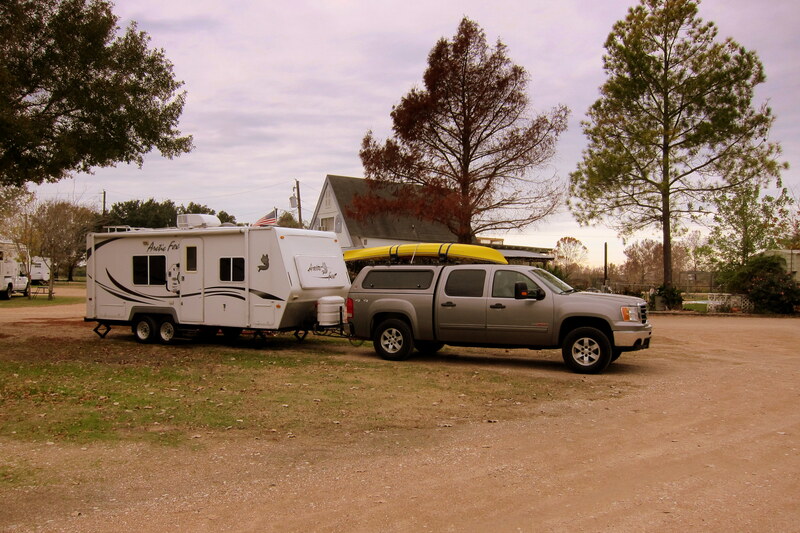 In addition to the campgrounds there are many athletic fields, picnic areas, and a marina with boat rental, a café, disc golf, paintball fields and nature trails. The campground was very well laid out with modern laundry and restroom facilities. 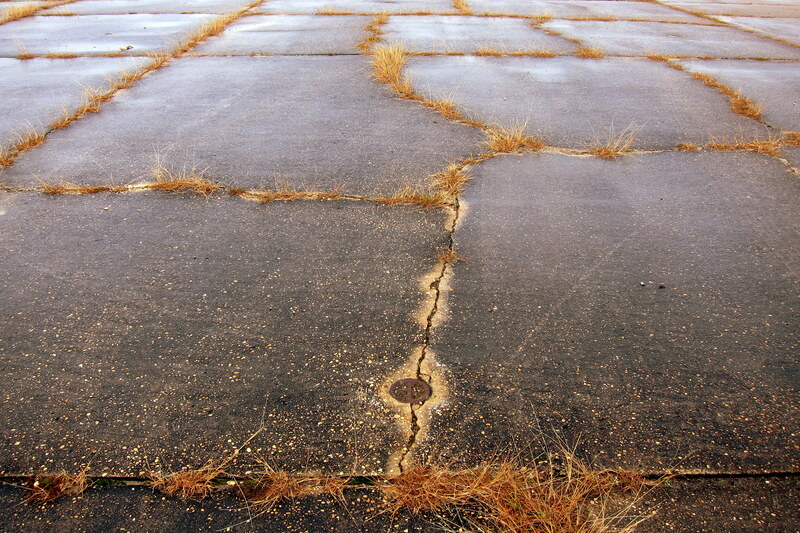 We selected a site nearest the bay but separated from water by the seaplane tarmac. There is also an older, more rustic campground to the north with limited services but in a very nice stand of trees. It is also less expensive to stay the night. 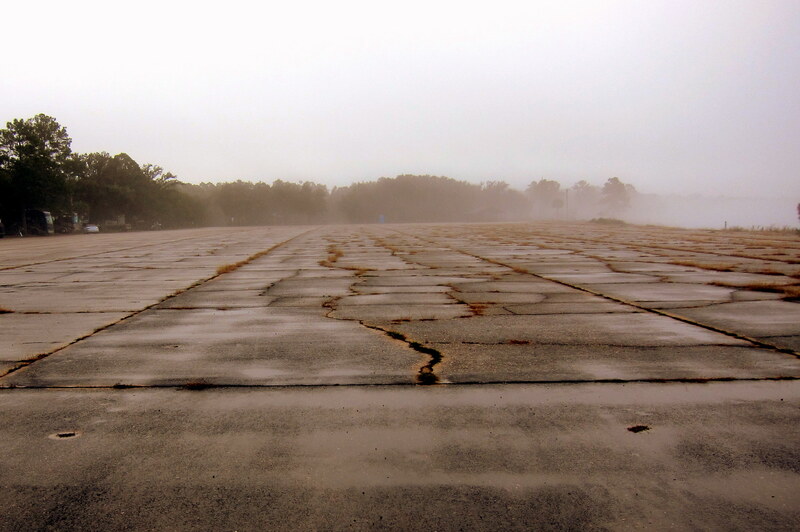 The seaplane ramps are now deteriorating and the thousands of iron tie-downs are rusting away. Well, enough goofing around…..one of my first orders of business was to replace the malfunctioning water heater element. 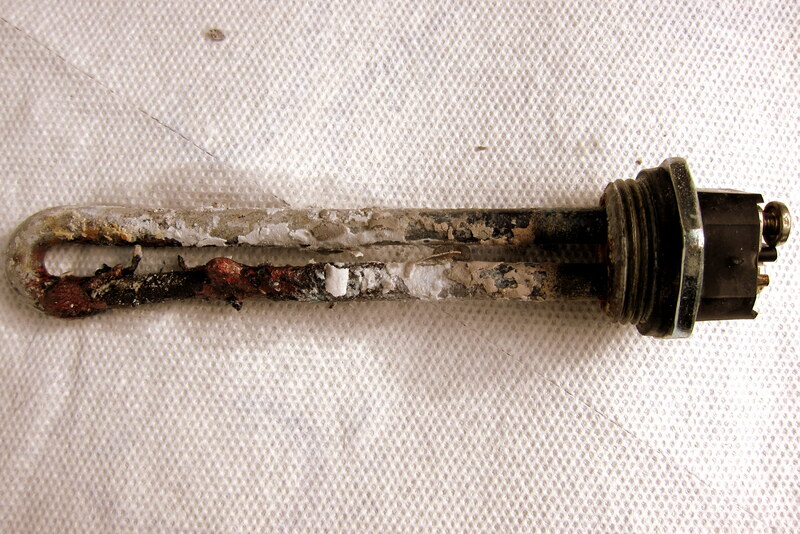 Note in the photo below what a heating element looks like when energized while not being immersed in water. I should hang this up somewhere to remind me to never do that again! Once that repair was made and since I already had the tools out and was in the fixing mood, I attended to a few other items as well as cleaned and re-greased the hitch components. I also cleaned and re-soaped the friction sway control mechanism. Everything should now be ready for our push west. While I was doing all this, Kit was over doing laundry. During the spin cycle she was out walking about and trying to pick up sailors. Well she ended up flirting with a guy who had served on one of my ships, The USS Robert H. McCard (DD-822). Danny was a Boatswains Mate who served for thirty years on active duty before retiring from Commander Naval Surface Force, U.S. Pacific Fleet (SURFPAC) as the Command Master Chief. Lots of sea stories and good times ensued. We exchanged contact information and hope to re-connect again soon. Being a retiree, I have a lot of time to poke around and be amused by what I observe. 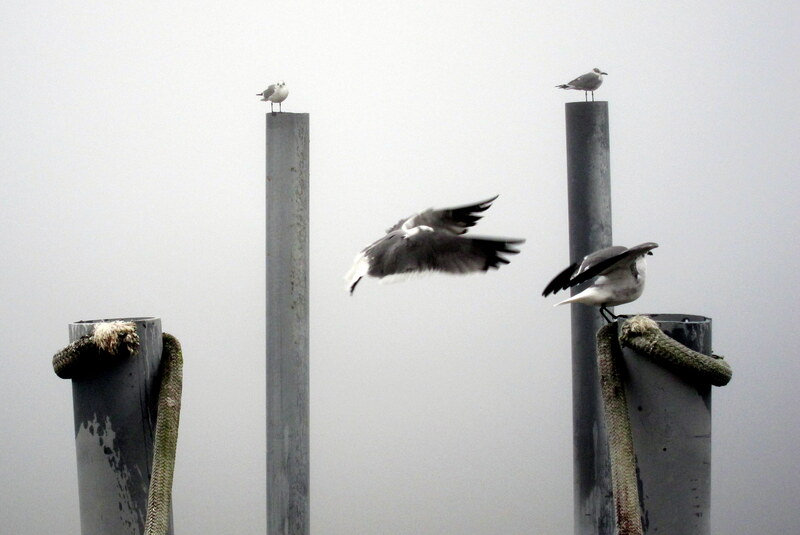 A case in point was these pilings out in Perdido Bay, apparently a prime roosting spots for seagulls. Evidently a hierarchal system of pole sitting existed as when one of the larger birds in the flock flew into the area it would displace a lower ranked bird which would then displace its subordinate and that bird would do the same, and so on and so on. The poor guy at the bottom of the totem pole (pun intended) would when have to just fly around aimlessly. A real metaphor for life, I would say! The next amusing thing I came across was at the marina. 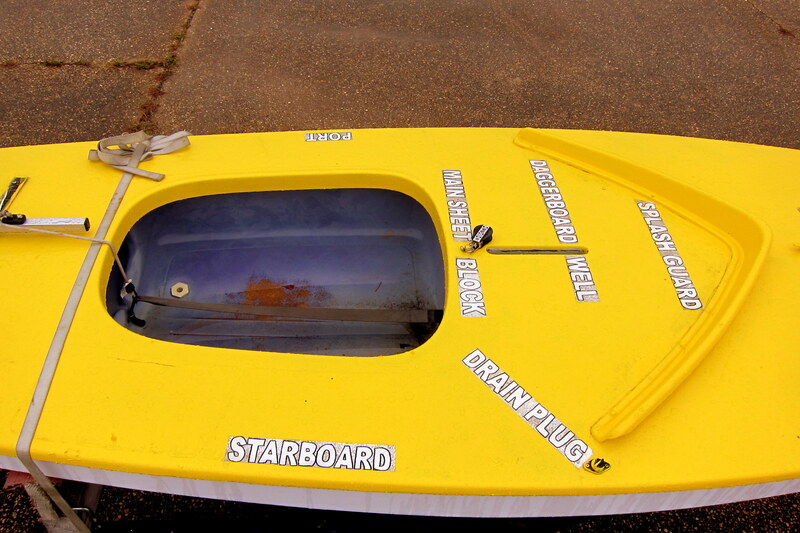 The rental sailboats had their nautical terms labeled on the boats…..at a Navy facility! I appreciate that this is an aviation facility but what’s my Navy coming too?!?! Since Cleon forced us this far south we decided to make the best of it. After all, if life gives you lemons find someone that received Gin and have a party! So when the sun peaked through we decided to explore the area. 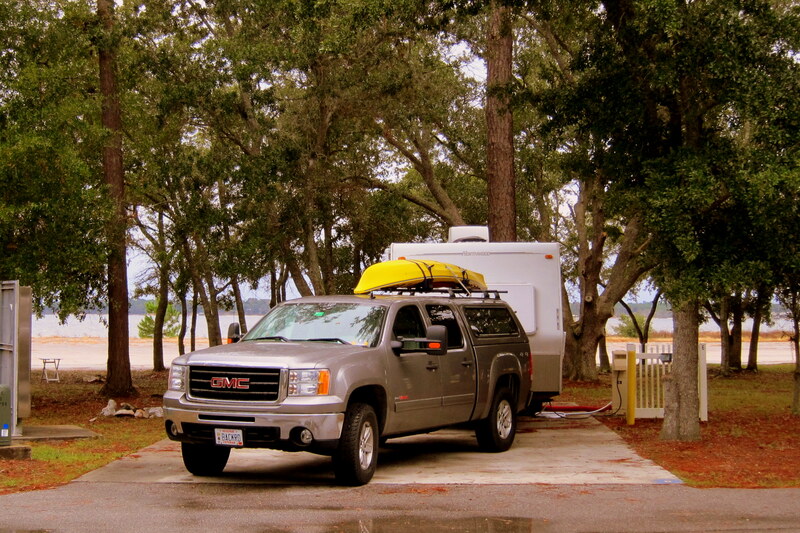 We meandered our way through the countryside and headed out to Perdido Key, known locally as “The Redneck Riviera”. 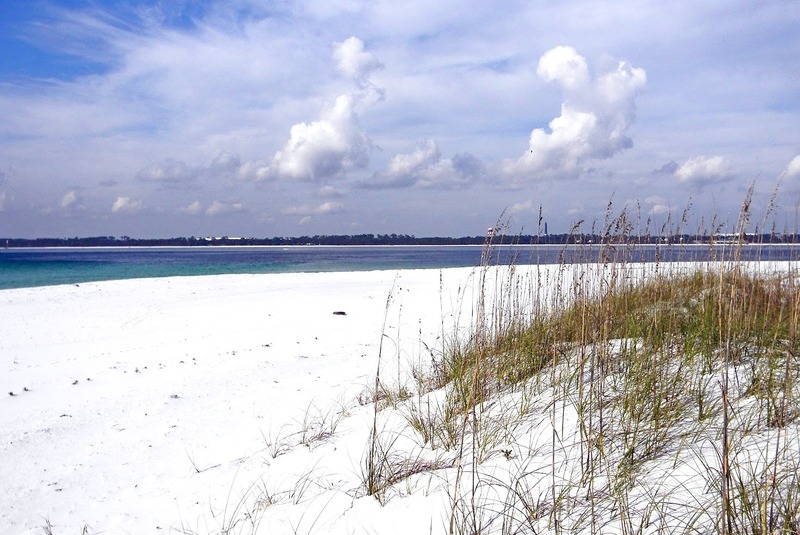 Perdido Key is a barrier island that straddles the Florida and Alabama line and is separated from the mainland by the Gulf Intercostal Waterway. 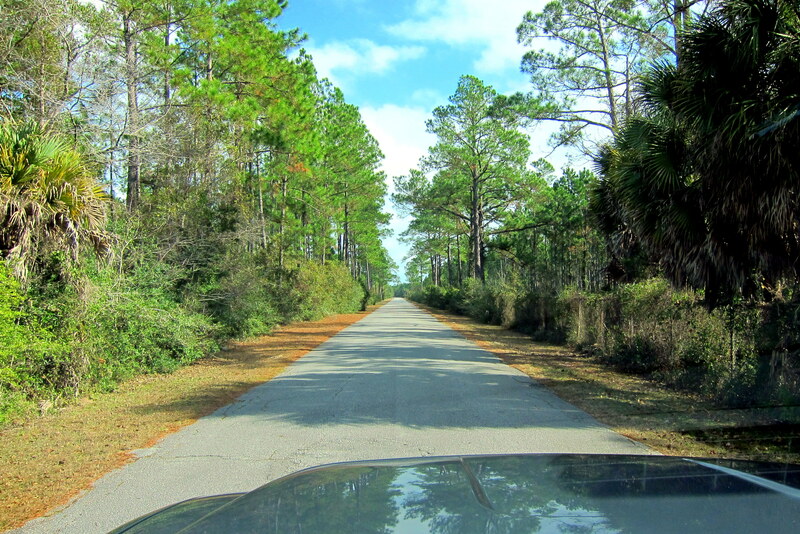 The 16 mile key is very narrow, only a few hundred yards wide in most places and populated by vacation homes and the typical seashore tourist businesses. Many of the cottages are painted unique pastel colors which Kit called “Ice Cream” colors. The beach sand was pure white and soft…….known locally as “Sugar Sand”. Nearing lunch time, we started looking for a nice local spot to eat. Stopping at the visitor’s center I asked the hostess where her favorite non-touristy spot was. 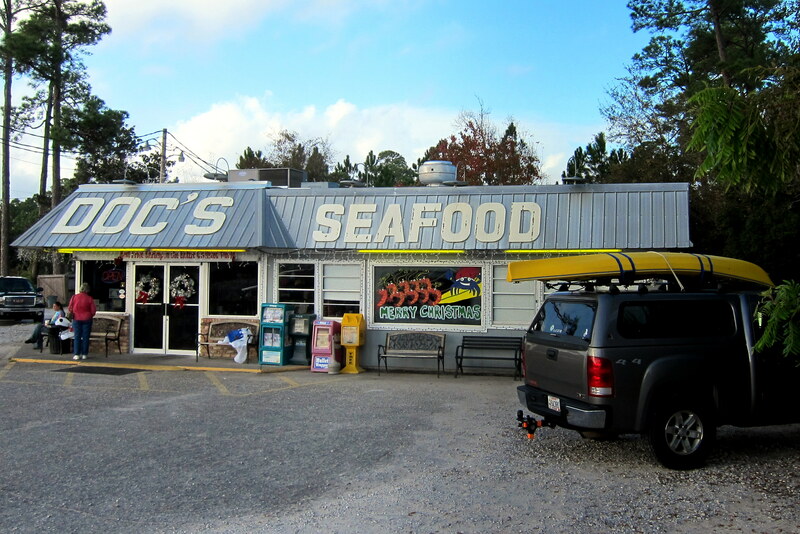 After a bit of prodding she directed us to Doc’s Seafood, the island folk’s favorite seafood dive. The food was inexpensive, plentiful and incredibly delicious…..I had fried Oysters and Kit enjoyed fried Saia. After lunch we continued to tour the area and happened upon this sad sight. You are looking at the last remaining old growth Native Pole (Vestibulum Polum) Forest. Many of these majestic species have been harvested to extension and this last stand is now protected by the Perdido Key Forestry Commission. Well, the sun sets in the west on another nice stay in the Pensacola area. Tomorrow we start traveling in that direction! Tuesday, December 10, 2013: Up and on the road at 0745 under rainy and cool temperatures…..the remnants of Winter Storm Cleon I’m guessing. 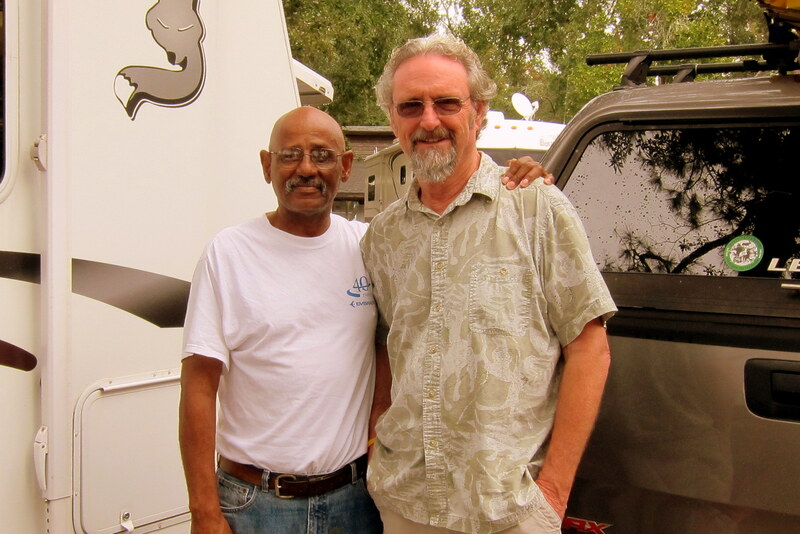 We meandered through the back country of western Florida until we came to US-59 which took us into Alabama and right past Johnny’s RV Emporium…..the place where our friends Vince and Candy fell prey to the upgrade disease earlier this year and traded in their camper for a much larger and nicer rig. Kit wanted to stop but I didn’t want to chance it so on we rolled. As a consolation we did stop at a Camping World a few miles away. Still trying to come to terms on a couple of folding camp chairs…..nothing here struck our fancy however. At 0948 we intersected I-10 and headed west passing through Mobile, Alabama before crossing the Mississippi state line at 1035. 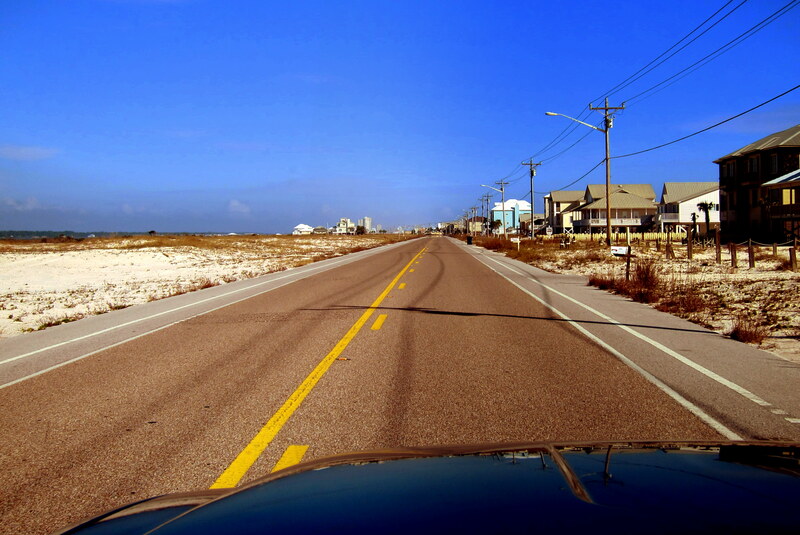 Normally at this point in our past travels we would drop down to US-90 and slide through all the unique coastal towns. However this trip we have a goal to reach Las Vegas the week before Christmas so we stayed on the more efficient and far more boring interstate. At 1050 we pulled into a rest area and enjoyed lunch in the camper. Back on I-10 we crossed into Louisiana at 1228 and an hour later came to I-12 which we took around the north shore of Lake Pontchartrain to Covington and our dear friends Johnny and Eileen. We had a very nice visit with them and two of their three grandchildren, Shelby and Gracen. 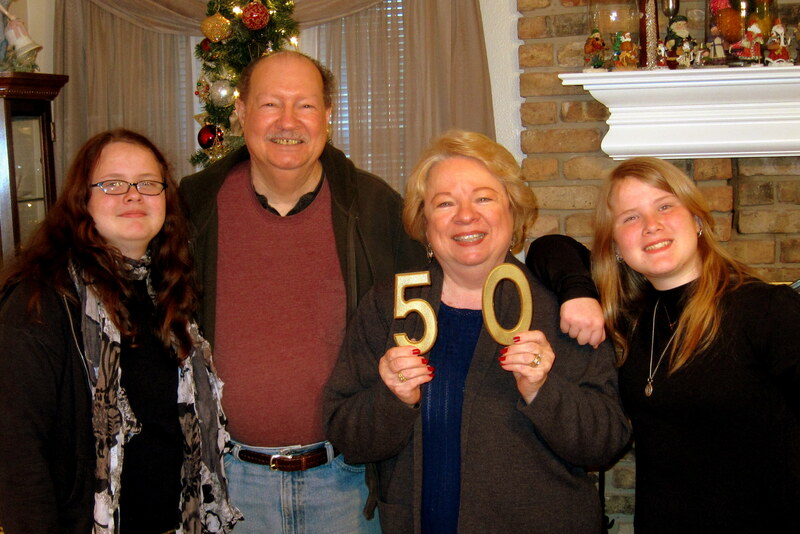 The “50” symbolizes the 50th wedding anniversary that they are celebrating. Their goal is to take many milestone photos to document the year, each containing the “50”. As a point of reference, Kit and I have known these folks for all but about two weeks of our 48 year married life. They are truly our oldest Navy friends. As is custom, we went out to dinner at one of their many favorite restaurants. 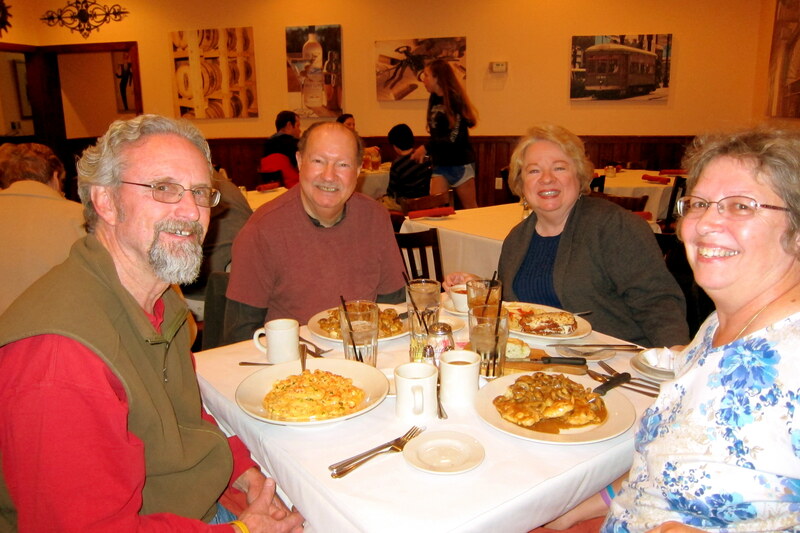 Some of the best meals we have had in this side of the US have been with Johnny and Eileen and today was no exception. This trip they brought us to Fazzio’s, a Cajun-Italian place famous on the north shore. 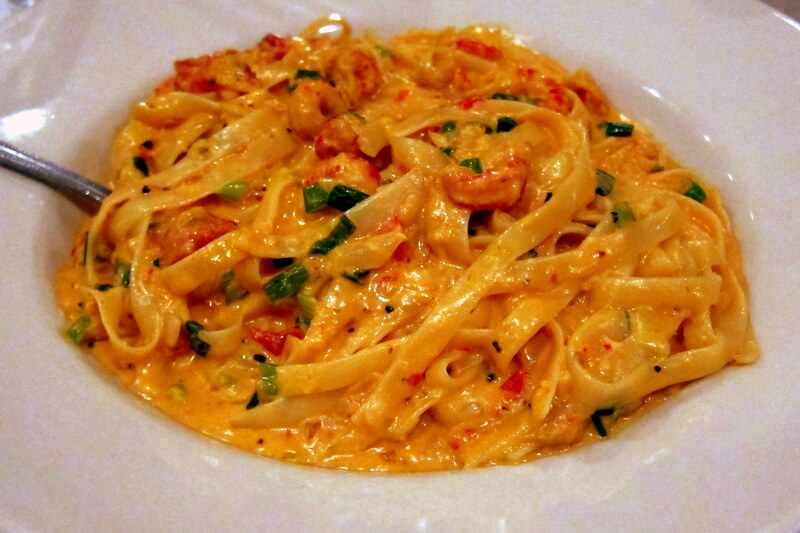 We all had excellent meals and I enjoyed an interesting dish…..Fettuccine Alfredo with Sauteed Crawfish. 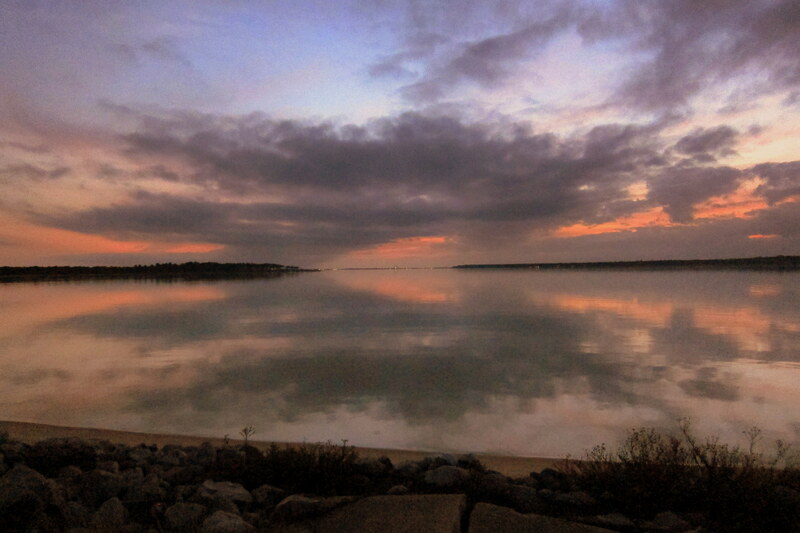 It was incredible…..even if it contained what I used to use for bait while Bass fishing. We were able to dooryard surf in their nice large circular driveway and said our goodbyes late that night as we wanted to get on the road at first light. Wednesday, December 11, 2013: Up early and on the road by 0700. It is cold at 34 degrees and cloudy. We made our way back to I-12 and continued west crossing the Mississippi River at 0821…..we are officially west, but still have 1,340 miles to reach our next major destination of Tucson, Arizona. Since we skipped out before breakfast we pulled into a Cracker Barrel for a hearty meal in the town of Yum, Louisiana. Back on the go, we crossed into Texas at 1226, and after a long day pulled into Columbus RV Park in Columbus Texas at 1607…..only 1001 miles to go before rolling into Tucson! Well, tomorrow we once again hit the road and continue our “Speed Run” toward the west and a much anticipated visit with my mom and our Tucson families…..stay tuned! Kit’s Corner: Best part of this leg of the trip was visiting with Johnny, Eileen, Shelby and Gracen! We were disappointed we didn’t get to see their sister, Kaitlyn, however, she is off to college now. Maybe next time we will catch her. Not so sure about these Speed Run’s; our friends Frank & Pat are quite fond of them but somehow, we have a hard time keeping up the momentum. We were able to do it when we were in our 20’s but it’s much harder now that we’re in our 60’s, even though “60 is the new 40”. Thanks for sharing with us. It let me escape for a moment from our reality here which includes a foot of fresh snow. Keep sending your sunshine. Safe travels! Amy R.
You’re welcome, thanks for the nice comment. Hope you folks have a very Merry Christmas and the best of the the New Year. Nice work as always guys. Love the food shots and the sugar sand. Stay safe. HARVESTED TO EXTENSION????? (VESTIBOLUM POLUM) SEE WE DO READ EACH AND EVERY WORD. THIS IS, I BELIEVE THE FIRST SPELLING ERROR IN ALL OF THE JOURNALS. WE’RE UP TO OUR BUTTS IN WHITE STUFF THIS MORNING, ALL PLOWED OUT AND THE STORM HAS MOVED DOWN EAST. WE GOT ABOUT 8/9 INCHES OF POWDER. KEEP SAFE AND DON’T FORGET TO STOP AND SMELL THE FLOWERS! Good catch, that typo was missed by the author as well as the proof reader. You win a prize…..how about an all expenses paid winter stay in a nice shoreline home on Maine’s beautiful Merrymeeting Bay? Hope you both have a very Merry Christmas and a happy and healthy New Year! You have the white sand but we have the real white stuff — 12+ inches! The good thing, I do not have to be out there shoveling anymore. I do envy you both for the adventure of traveling. Hope the weather cooperates for you so you can make Tucsan on schedule. Thanks guys for the comment. Hear you are having an open house at your new digs…..hope we can take a rain check! Please have a very Merry Christmas and a Happy New Year. Take care of each other and stay safe! Great picture of Johnny, Eileen, Shelby and Gracen! And, I think the ice cream beach houses look more like square Easter eggs. 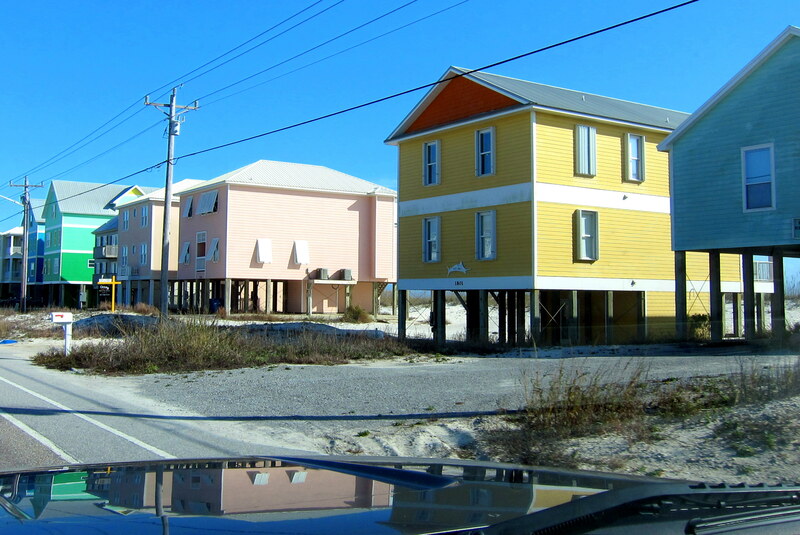 Thanks, they are doing well and your right…..those cottages did look more like Easter egg colors! Thanks, we are enjoying our travels as well. Please have a great Christmas with Sandy and Marie…..we will be thinking about you next Wednesday. We have snow up the Wazoo. Looks like a long road ahead. 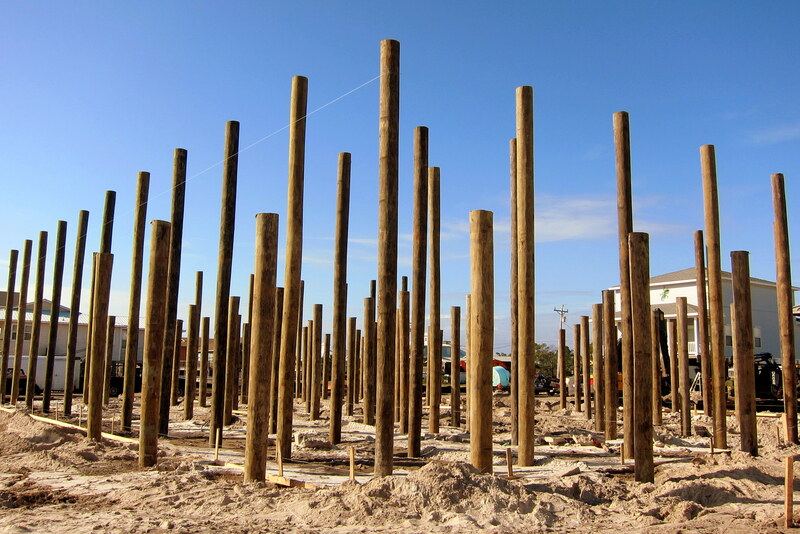 I and Linda have also been to Perdido Key we stayed on one of those pilings. Merry Christmas to you as well, Bob! Sorry, I’m late catching up to your travel log……once again your meal pictures are extraordinary….where is Docs?…….this December has been the harshest in a very long time….I’m ready for condo living like Gerry and Denise are now doing (lol). Thanks Brian, yep I love to eat great regional food! 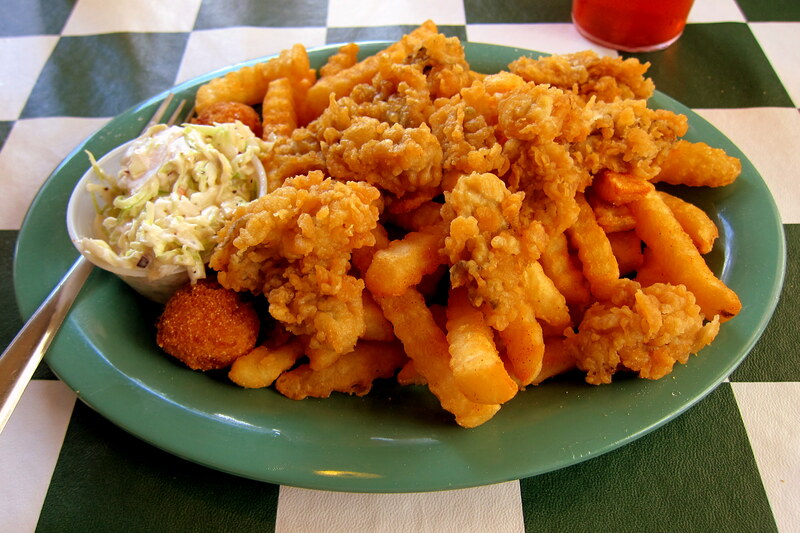 Doc’s seafood Shack and Oyster Bar is in Orange Beach, Alabama…..just on the Al/FL border on Perdido Key. Looks like you all received more snow and now are dealing with bitter cold…..bet you’re looking forward to your upcoming road trip! Heard the New Year’s Eve dance came off without a hitch, wish we could have been there to celebrate with you all. Please say hi to all our Sage Friends at the next workshop. Hope you and Martha have a great New Year! I am reading #2 out of order. Just a bit behind. Thoroughly enjoy reading your blogs.